Systematic investment plans, better known as SIPs, have registered a 38 percent on-year rise in collections to Rs 92,693 crore, despite the equity market grappling with volatility during the same period. According to data provided by the Association of Mutual Funds in India (AMFI), mutual funds collected a total of Rs 67,190 crore through SIPs in April-March FY18. 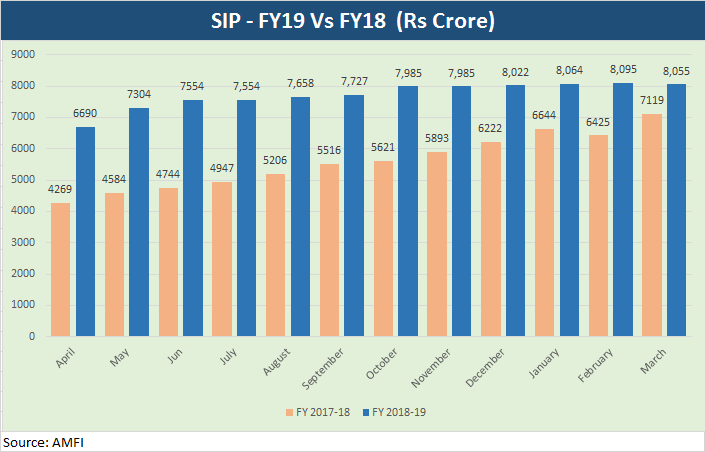 The data reveals that the MF industry has added 9.13 lakh SIP accounts on average each month with average SIP size at around Rs 3,070 per account. “We have seen an uptrend in SIP numbers in each month. We have not seen any slowdown in the opening of SIP accounts despite volatile markets,” said NS Venkatesh, Chief Executive Officer, AMFI. At present, domestic mutual funds have about 2.62 crore SIP accounts through which investors regularly invest in Indian mutual fund schemes. Foreign institutional investor outflows, high crude oil prices and the depreciation of the rupee against the dollar kept Indian equity markets volatile. Amid intermittent volatility, Sensex gained 18.77 percent in FY19. The data by AMFI clearly shows that despite the markets being volatile, investors are not shunning SIPs. Experts said investors are becoming more savvy and mature. SIPs are investment plans offered by MFs wherein one can invest a fixed amount in a scheme periodically at fixed intervals, say once a month, instead of making a lump-sum investment. The SIP instalment amount could be as small as Rs 500 per month. SIP is similar to a recurring deposit offered by banks wherein you deposit a small/fixed amount every month. SIP is a very convenient method of investing in MFs. By issuing standing instructions to your bank to debit your account every month, one can avoid the hassle of having to write out a cheque. This method has been gaining popularity among Indian MF investors, as it helps in rupee cost averaging and also in investing in a disciplined manner without worrying about volatility and timing the market. SIPs help investors average their cost over a period of time, fetching more units when prices are low and fewer units when prices are high. In the current scenario, buying at low prices and selling at higher prices works brilliantly because the volatility means you buy more units at a lesser price and hence, your ultimate returns will be better. Experts also feel investor education initiatives by AMFI and industry players are aiding SIP flows. Over the years, investors have also matured and have learnt to ignore the market noise and continue investing through SIPs month after month. This unwavering discipline has helped many SIP investors build an impressive portfolio. This provides confidence to MF officials who now feel that SIP flows will remain steady and will not go away when the market is volatile.